Dhaka, Dec 4 (Just News): BNP on Monday termed indecent the Election Commission's (EC's) announcement about the by-election to the mayoral post of Dhaka North City Corporation (DNCC) just a day after its mayor Annisul Huq was buried. "He (Annisul) was just buried. I don't think it's decent to think of a by-election just after his burial. We've seen some people are talking about the polls moments after he was buried. Our society doesn't like it," said BNP senior joint secretary general Ruhul Kabir Rizvi. Speaking at a press conference at BNP's Nayapaltan central office, he said their party will talk about the DNCC election issue after a few days. 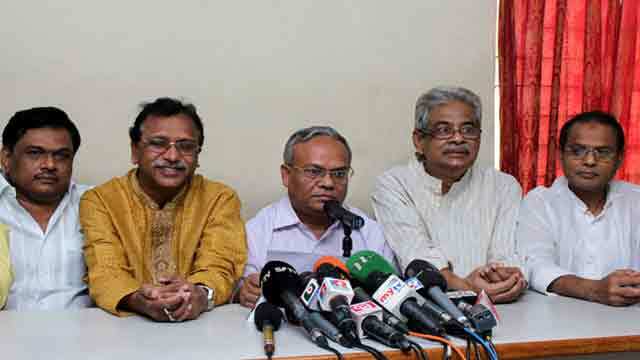 Earlier on Sunday, EC Secretary Helaluddin Ahmed told reporters that the Commission is ready to hold the by-polls to the mayoral post of the DNCC within the next 90 days as the post fell vacant following the death of Annisul Huq. He said the Commission will start the election process soon after the gazette is published by the Local Government Ministry declaring the mayoral post vacant. Annisul Huq, who was elected the DNCC mayor on April 28, 2015 with Awami League ticket, passed away at a hospital in London on Thursday. He was laid to rest at the Banani graveyard on Saturday afternoon. Rizvi also came down hard on Chief Election Commissioner KM Nurul Huda for what he said speaking in the same tone of Awami League general secretary Obaidul Quader about the snap polls. "It's exposed that he (CEC) will walk on the old way designed by the government." The BNP leader said it is the constitutional duty of an independent EC to arrange a credible and neutral election. "It appears that the current CEC won't take the issue of free, fair and impartial election into his consideration only to protect his job." He urged the CEC not to work as a caged parrot of the government and fulfill is evil desires. Rizvi urged the government to take steps for holding the 11th parliamentary elections under a non-party neutral administration dissolving parliament. About the Prime Minister's Cambodia tour, the BNP leader said she went there mainly to unveil the plaque of a road in Phnom Penh after the name of Bangabandhu Sheikh Mujibur Rahman spending huge public money. He also alleged that the Prime Minister has got desperate to establish her family's name by depilating public exchequer. Rizvi said despite the repeated call by BNP and intellectuals to the Prime Minister for visiting India, China and other influential countries for having a solution to the Rohingya crisis, she did not take any initiative in this regard for mysterious reasons.